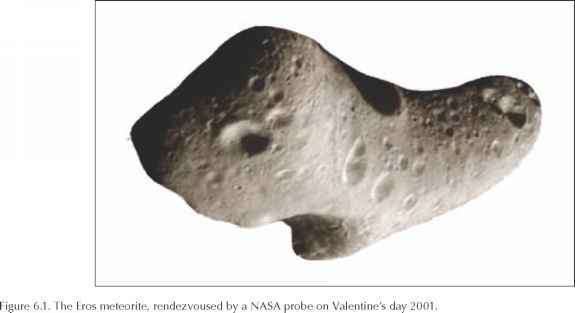 Because ofthe particularly pristine nature of CC and the general availability ofmeteorites, their organic material offers to direct analysis a unique natural sample of abiotic organic chemistry as it came to be in the Solar System shortly before the onset of life. Figure 6.2. An interior fragment of the Murchison meteorite and a microscopic view of its matrix and inclusions. Courtesy of Dr. Michael E. Zolensky, NASA Johnson Space Center. insoluble after all and can release some individual compounds under conditions ofhigh T and P similar to those ofterrestrial hydrothermal vents (300°C, 100 MPa). For many carbonaceous meteorites ofthe same type as Murchison as well as others, the remaining portion ofthe organic carbon is made up of soluble compounds that are released from meteorite powders by extraction with water and solvents (Table 6.2).3 As it can be seen by their names and structures, many of the types of individual compounds known to us throughout the Biosphere are found present in meteorites. Meteoritic organic compounds, although in amounts of only parts per million (ppm, micrograms/gram of meteorite), are found in a large variety offorms, which often contain all the possible structures for a given chemical group and up to the limits of their solubility. For example, while the whole ofterrestrial proteins is made up of just twenty amino acids, all of the a-amino type, over one hundred kinds of meteoritic amino acids are found, which vary over many, sometimes all, of the possible chemical structures involving an alkyl chain, one or two carboxyl- and one or two amino-groups (Scheme 6.1). Ten amino acids are found in both CC and terrestrial proteins: glycine, alanine, serine, threonine, valine, leucine, isoleucine, proline, aspartic acid and glutamic acid (serine and threonine have been detected only recently in the GRA 95229 Antartica meteorite from the Johnson Space Center). Figure 6.3. Make-up of the insoluble organic carbon in the Murchison meteorite. 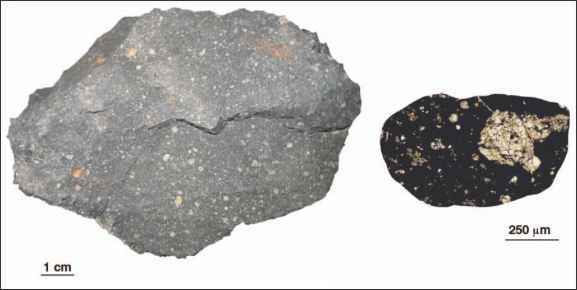 The most interesting similarity between meteoritic and biological compounds is that some of the chiral amino acids of meteorites display L-enantiomeric excesses (ee) that, ifnot as large, are similar to the ones found in the amino acids of terrestrial proteins. 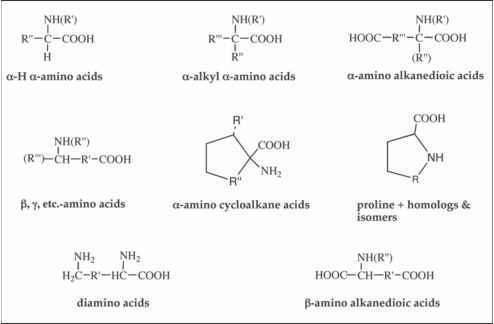 So far, the ee have been determined unequivocally for the subgroup of the a-amino-a-alkyl amino acids.5 They vary from 0-15% and represent the only example of molecular asymmetry outside the biosphere (see Chapter 7 for details on molecular chirality and its distribution in the biosphere). The finding ofee in meteoritic amino acids seems to suggest that the trait of chiral asymmetry was at least in part available to prebiotic chemistry. 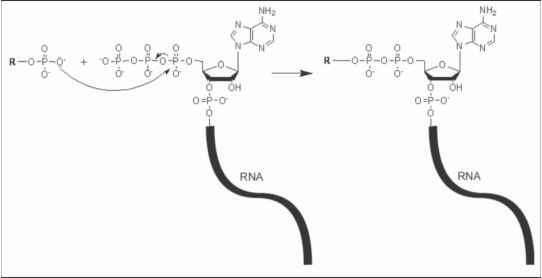 The origin of these ee is not known and could have been the result ofasymmetric influences either during or after chiral amino acid formation. For example, circularly polarized light (CPL) is a form of radiation where the electric and magnetic vectors rotate along the axis of transmission. This rotation can take a clockwise or counter-clockwise turn; therefore there will be a right- and left-CPL that are mirror images of each other, chiral and will each interact differently with the two enantiomers ofa chiral molecule (Chapter 7). If this radiation is "one-handed" and has high enough energy to be destructive of the molecule (as in the case of UV CPL), the two enantiomers will be destroyed at different rates and may leave one enantiomer in a larger amount than the other after exposure.c It has been proposed that such an effect could have taken place during the formation of meteoritic amino acids, possibly at the stage ofprecursor molecules and before reaching the shielding of the asteroidal parent body (see following). Scheme 6.1. 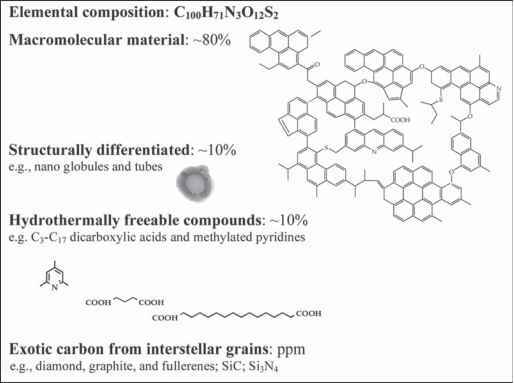 Diverse molecular composition of the organic compounds in meteorites.